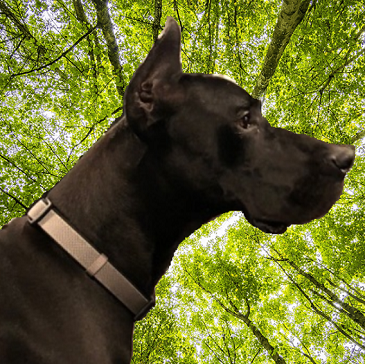 Ranger - Rocky Mountain Great Dane Rescue, Inc.
Hi, I’m Ranger! 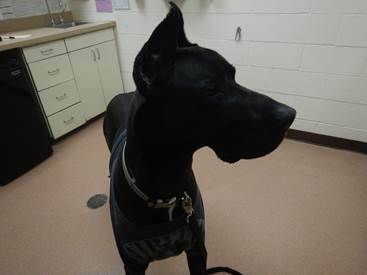 I’m a 2 year old black male Dane with cropped ears. I’ve kind of had a crazy life so far, so I’m really excited to find a forever home to call my very own and finally get to settle in. I’ve done pretty well around other dogs in the shelter and passed my test and other than that, I haven’t had a lot of exposure to other dogs, cats or kids. I am super nervous around strangers though, especially men, so I need slow introductions and time to get to know them before I’m okay. It is best if I am not around small children. In terms of training, I know all of my basic commands and am housebroken. 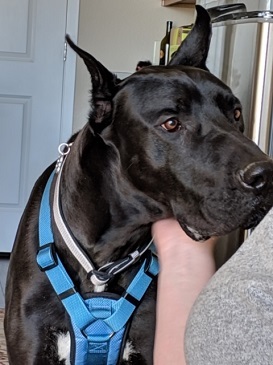 I walk really well on a leash with a harness and I’m also trustworthy with free roam. Oh, I do well in a crate, but getting me into one is another story (they’re not my favorite thing in the world). I think that mostly covers the big things, but we should really get together to see if you could be my perfect family!